Editor's Note: This article is a supplement to "US Caught Meddling in Russian Elections!" December 5, 2011 - Before reading the following "interests" the United States government with US tax money, is pursing within the sovereign Russian Federation, it may be instructive to know just who constitutes the National Endowment for Democracy, the umbrella organization that funds a literal army of global sedition. (NED's funding for Russian NGOs is listed last). Video: Not everyone pretends US meddling in Russia is in the best interest of Russia, the US or the world. 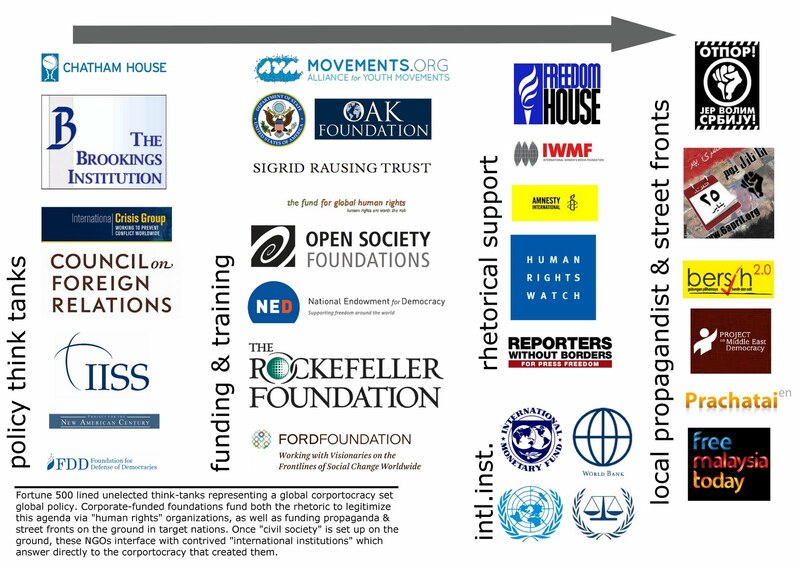 For a full description of NEDs Board of Directors, their affiliations and guiding ideologies of which they've articulated in signed documents available freely on the Internet from their official think-tank websites, please read: NED & Freedom House are run by Warmongering Imperialists. One may also ask, just how Americans would feel, if a similar effort was made to interfere in US politics, where leaders were "identified" and "supported" by foreign nations seeking to establish what they considered acceptable political institutions to govern the US as they saw fit. NDI has been working to support and strengthen democratic institutions in the Russian Federation since the early 1990s by stimulating greater citizen participation in decision-making processes and strengthening civic organizations and political parties through international exchanges of experience. Through its Moscow based office, NDI Russia has partnered with civic organizations in St. Petersburg, Krasnodar, Yaroslavl, Chelyabinsk, Syktyvkar, Moscow, Astrakhan, Kaliningrad and Nizhniy Novgorod, among other regions. The Institute seeks to share its internationally recognized expertise with non-partisan election observation groups, promote constructive dialogue on issues of mutual interest to Russians and their international counterparts, strengthen civic organizations and political parties through international exchange programs and support of Russian initiatives for citizen engagement in politics at the regional level. NDI’s regional work aims to assist political, civic and government partners interested in community outreach, organizational capacity development, and constructive dialogue between civil society and government to achieve community well-being. The Institute works through consultations, workshops and issues conferences. 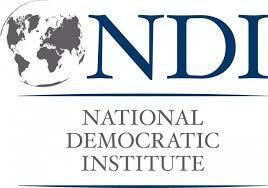 NDI Russia is an officially registered representative office of the National Democratic Institute for International Affairs. It is not a grant-making organization and its activities are directed toward facilitating organizations and individuals in their efforts to improve their effectiveness as civic actors and government officials. NDI Russia facilitates discussions on important issues affecting citizens’ daily lives, via forums with elected officials and policymakers, roundtables for NGOs sharing common concerns, and advocacy and citizen participation workshops. The events bring together a diverse group of experts, activists and officials to share experiences, perspectives and best practices on issues of interest to Russian audiences. Since 2009, NDI has held a series of workshops in Yaroslavl, St. Petersburg, Nizhny Novgorod and Syktyvkar for representatives of regional and local governments, NGOs, universities and small businesses on methods of building positive and constructive relations between local government, citizens and civil society. As a follow up to these workshops, NDI has held open forums for civil society participants to discuss important issues with their colleagues and local government aimed at resolving community problems. NDI Russia helps young Russian community leaders develop greater capacity to effectively engage in civic and political processes and provides opportunities for them to compare experiences and share ideas with their international peers. Since 2009 NDI has organized study programs to Brussels, which allow Russian youth to compare Russian and European political processes and explore how European youth participate in public life. During the one-week study programs, participants meet with representatives of nongovernmental organizations, political parties and government agencies at the European, national and local levels, and take part in practical workshops designed to help them apply European experience to their work in Russia. The Institute assists participants in applying lessons learned in local civic activism to help them organize social and educational projects to benefit their home communities in Russia. Also, NDI has supported a network of youth debate clubs in Pskov, Karelia, Veliky Novgorod, St. Petersburg and Arkhangelsk. The debates offer unique venues for public discussion of youth-related issues in an informal setting. Debate leaders and participants represent a diverse cross section of youth society in each region, including a broad spectrum of political and civic groups. NDI conducts an exchange program for Russian legislators and political and civic leaders to discuss policy issues with their counterparts in the U.S. The aim of the visits is to help policymakers on both sides broaden their perspectives and better design their own approaches to key domestic policy issues. In 2009 and 2010, NDI arranged a study mission to the U.S. for Russian regional government officials and media professionals in partnership with the Russian NGO Institute for Democracy and Development, and also organized a trip for local government officials from Leningrad Oblast and St. Petersburg to share experiences in urban planning and regional economic development with their counterparts in Maryland. NDI also organized a trilateral dialogue in Washington, D.C., between members of the European Parliament, State Duma deputies, and members of Congress on issues related to economics, security and governance. Since 2000, NDI has worked with GOLOS, an independent, nonpartisan, Russian election observation network covering over 40 regions. NDI provides ongoing consultation and training for the organization’s regional partners, sharing its international election observation expertise. NDI is open to cooperating with all domestic groups that believe in free and fair elections, impartial and objective election observation and internationally accepted election observation standards. RI's programming in Russia supports the development of a more open, participatory and democratic society. IRI supports the political and civic development of the country by promoting and supporting engagement between citizens and political actors. IRI’s programming represents a unique blend of politically-oriented trainings and events designed to promote a nationwide grassroots democratic movement. Grouped under four categories – civic leadership development, youth and women leadership, legislative exchange, and regional and local development – IRI’s programs seek out opportunities to foster the leadership, institutions and popular support needed to ensure that Russia achieves the democracy it was promised with the fall of communism almost 20 years ago. IRI has been working with Russian civic activists, grassroots organizers and civil society institutions to strengthen the ability of citizens to advocate for needed changes, and increase overall citizen participation and interest in the political processes. Through training in advanced communication technologies, effective campaign strategies and supporting think tanks, IRI has been able to foster and educate civil leaders who are capable of establishing constituent-focused processes and advocating for reforms. IRI has also been supporting Russia’s civil society by providing online and offline networking opportunities and high-quality expert advice. IRI is promoting a number of initiatives to involve Russia’s young people in all aspects of the democratic process – from voting, to running for office, to starting a nongovernmental organization (NGO). These efforts help regional youth organizations become involved in politics and public affairs, build networks for inter-regional and international youth cooperation and identify future political leaders. IRI has also been contributing to the development of a Women’s Democracy Network chapter in Russia – an umbrella organization that helps women leaders to enhance their role in social and political processes. IRI is working to launch legislative and executive exchanges between the legislative and executive bodies of the Russian Federation and the United States. Through the promotion of cooperation and understanding between both sides, it is the objective of this program to encourage the development of sustainable relationships between Russian and American government authorities. IRI believes that identifying and supporting leaders at the local and regional levels can help lay the groundwork for Russia’s next generation of democratic leadership. IRI has therefore created a new network of politicians, NGO activists and elected officials who are interested in the democratic development of municipal governance. Through this network, as well as IRI-sponsored conferences and roundtables, local elected officials, NGOs and party members learn how to contribute to increased public participation in local governance and meaningful interaction between citizens and local and regional deputies. By these efforts, IRI is trying to promote the implementation of local and regional development programs oriented on democratic governance and close interaction between power and citizens. To monitor government responsiveness to victims’ concerns and to encourage greater openness and transparency in the handling of terrorism attacks, natural disasters and other extraordinary situa­tions. To promote justice and accountability for the victims of the September 2004 hostage seizure in Beslan, Ingushetia, and more than 1,600 surviving family mem­bers who have never received adequate compensation for their loss or a coher­ent explanation of what took place. To maintain, expand and promote its interactive online portal, www.trudprava.ru, which provides information about labor rights and equips workers with the neces­sary skills to defend these rights. This website serves as an independent and ob­jective source of information to help work­ers make informed decisions and improve their working conditions. The Center will promote the use of its website by Russian media as a source of news on labor issues. To conduct a series of seminars for teachers from neighboring regions and prepare electronic versions of histori­cal and methodological material. Seminar participants will later use their knowledge to lead classroom lessons on the history of political repression in the Soviet Union. The Center will host electronic versions of educational material on its website for pub­lic access. The Center will also maintain its museum dedicated to political repression. To conduct qualitative research into the organization, strategies and perspectives of leaders in the noncommercial sector and socially active youth, with a particular focus on their strategies for interacting with government institutions and the public. Levada Center will conduct one hundred interviews with experts, opinion leaders and members of Russian NGOs and will publish a report detailing the results of the project, to be used for discussion in a wide variety of academic and activist forums. To produce a film examining the antifascist youth movement in Russia. The Institute will increase awareness of racism and xenophobia in Russia through interviews with leaders of the antifascist movement in Moscow, Petrozavodsk, St. Petersburg, and Kirov. The film will examine subcul­tures of anti-fascism such as music, art, and civic activism. The filmmakers will also travel to Kyiv and Minsk to investigate the connection between football hooligan­ism and the spread of neo-Nazi ideology. To increase the transparency and ac­countability of NGOs in Russia, as well as public trust in NGOs. ASI will hold open discussions with NGO representatives, civil society experts, and civic activists in five oblasts; develop expert recommenda­tions on improving NGO transparency and accountability; and hold a seminar for regional NGOs on improving public trust. To publicize incidents of kidnapping and forced disappearance, and to encourage officials to investigate such events thor­oughly. Mashr will collect information about abductions, rapidly publicize such cases, and offer legal assistance for the victims. To provide advanced training on inter­national judicial procedures to human rights lawyers from Russia and other CIS countries. The Center serves as the Strasbourg office of the Moscow-based International Protection Center (IPC), an Endowment recipient with extensive experience assisting citizens whose rights have been violated in appealing to the European Court of Human Rights. To conduct a human rights and legal education program in Chelyabinsk and Sverdlovsk Oblasts. The Center will oper­ate four distinct programs: first, the School of Human Rights, which will provide training to student journalists and leaders; second, a resource center for local NGOs; third, the “Human Rights Ambulance,” which will provide legal aid in pretrial detention centers; and fourth, “Feedback,” an assistance program for journalists. To continue the “Stockholm Process” which coordinates strategies to ad­dress human rights abuses in the North Caucasus among relevant NGOs. A training, a conference, and advocacy events will be organized to support the activists working in the region. To publish its newspaper, Dagestanskii Rakurs (Dagestan Perspective), an in­dependent human rights publication in Dagestan. The newspaper will be pub­lished biweekly in an eight-page tabloid format with a print run of 1,500 copies. Dagestanskii Rakurs covers topics of relevance to human rights and democracy. To develop the organization’s ability to disseminate human rights information to a global audience. A staff member from Memorial’s Grozny office will complete a course of study at the University of Illinois. To ensure citizens’ rights to find, view, and distribute government information in accordance with the Russian con­stitution. The organization will monitor government information resources and related practices, disseminate news and resources on its web site, and sup­port litigation to secure greater public access to government information. To increase the level of legal knowledge among NGOs in the Saint Petersburg and Saratov regions. The HHRC will offer training and other forms of assistance to newly-formed NGOs and initiative groups. HRRC will work in St. Petersburg and Saratov oblasts, two regions in which it has identified large numbers of new NGOs that need assistance with registration. To organize its eighth annual “Interre­gional Contest of Teachers on the His­tory of Political Repression in the USSR.” This contest provides history teachers in schools across Russia with an opportu­nity to create an original lesson plan and supplementary materials on topics such as Stalinism, political repression, the GULAG system, human rights and the dissident movement. The lessons plans are then en­tered into a national contest, with the best entries compiled for use by other teachers. To render legal and informational assis­tance to Russian activists and organiza­tions under pressure from the authorities as a result of their work. AGORA will support human rights groups and activ­ ists faced with criminal and civil suits, arrests, repeated investigations, and campaigns to discredit their work. AGORA will also help NGOs improve the security of their finances, information systems, management, and personnel, and will assist with public relations. To support its operations, including main­taining exhibits on human rights, operating a library on the history of political repres­sion, and providing a video center and an Internet classroom for students and teach­ers studying human rights. It will also oper­ate a public legal aid office, help teachers and NGO activists develop teaching materi­als for young people, and offer manage­ment and financial training to NGO leaders. To support its program of increasing citizen participation in local government in Yaroslavl oblast. In addition, the Center will evaluate the state of civil society and devel­op suggestions to make the work of NGOs more effective in cooperation with the local government and the Yaroslavl oblast Public Chamber. The Center will focus its efforts through its NGO School, School of Public Politics, and Annual Civil Forum. To reduce the incidence of torture in Chechnya. The Committee will moni­tor and publicize cases of torture at the hands of law enforcement officials and will offer legal aid to the victims. With a field office in the Chechen capital of Grozny, and legal staff and project coordination based in Nizhny Novgorod, CAT is uniquely positioned to carry out these activities. To gather and disseminate reliable, timely information about events in Chechnya and the North Caucasus via the inter­net, and to support the development of Chechen civil society through round­tables, conferences and other events. To strengthen civil society in Izhevsk, the capital of the Udmurt Republic, by pro­moting cooperation among NGO activ­ists, members of local government, the business sector, and media representa­tives. CSEI will host four roundtables and organize a “School for Civic Lead­ers,” to bring together members from the private and public sectors from Izhevsk and the surrounding region. CSEI will maintain its support, consultation, and information resources and update its website with NGO events in the region. To continue its program of human rights activism in the predominantly Muslim republic of Kabardino-Balkaria in the North Caucasus. The Center will render free legal aid, monitor the activity of the courts, research Stalin-era crimes in Kabardino-Balkaria, and hold a series of roundtables and conferences to deepen local under­standing of these issues and reduce the appeal of political extremism by lowering tensions between law enforcement author­ities and the region’s Muslim community. To foster youth participation in the northwest federal district of Russia through a youth debate club program, study mission for young leaders, and a series of issue advocacy and leadership workshops, webinars and a funders fair designed to help youth begin or expand into civic and political activism. NDI will follow up with program participants to assist in conducting civic advocacy and other community-based projects. To maintain and expand its publicly ac­cessible online database of federal and regional laws that regulate NGOs and their interactions with authorities. The organization will develop draft legislation to strengthen cooperation between civil so­ciety and government and will provide free online consultations for NGOs throughout Russia on legislation pertaining to NGO-government cooperation. The organiza­tion will add a new feedback component to its website to help answer questions from authorities on working with NGOs. To prepare twelve issues of the Mass Media Legislative Journal, which provides Russia’s media community with timely and reliable information relating to media law. The publication focuses on legisla­tion, news about legal actions against media, accounts of incidents of harass­ment and intimidation against journalists, and practical advice for media workers about how to deal with these problems. To develop dialogue between local authorities and youth in the Republic of Dagestan. The organization will con­tinue to partner with Dagestan-based NGO “Alternative to Violence” to pro­vide local insight, and assist in program implementation and monitoring. The organization will hold seminars at five Dagestani universities, conduct work­shops on issues affecting youth, sup­port the implementation of community initiatives, and prepare policy documents and hold consultations on regional youth policies with local and federal officials. To stem widespread abuses of human rights in Russia’s closed cities, or ZATOs. The project will involve research, lobbying, teacher training, and public information campaigns in Ozersk and nearby cities. Planet of Hopes will organize mobile legal reception centers in other small towns and villages in the Ozersk area, prepare and submit cases to the European Court of Human Rights in Strasbourg, and publish its own small-circulation newspaper. To improve the teaching of human rights and civic education in Russia’s schools and universities. The Center will hold its annual Human Rights Olympiad for students in Perm oblast, organize educational semi­nars for graduates of the Center for Civic Education and teachers in rural Russia, and further develop its national teacher training seminar for the development of human rights curricula. The Center will maintain a blog and conduct an internet campaign to increase youth activism. To conduct human rights training and consultations for approximately 1,000 draftees, draft-age youth, servicemen, and their families in Pskov oblast. The organi­zation will hold seminars, publish a bulletin, and provide individual consultations. To organize, preserve, and digitize the Center’s physical archives document­ing political repression during the Soviet era. The Center will purchase a server and additional hosted-server space for its database, through which entries will be accessible by direct content searches and macro-tags. Memorial will also lead a two-day seminar for nine partner organizations in the Memorial Network to train them in the use of its custom-designed proprietary database software and archival techniques. To conduct three seminars and training sessions for at least 20 selectively chosen students aimed at raising civic aware­ness and engagement among the youth of Chechnya. Topics will include human rights, civic activism and tolerance. Activities will include theoretical lectures, brainstorm­ing, practical exercises and small-scale initiatives to be completed by the students to help them develop skills to defend their own interests and those of others and actively agitate for human rights. To offer free legal representation and consultation to the victims of human rights violations in Russia. The Center will help individuals who have exhausted all available remedies under the Russian court system to pursue their cases through the Euro­pean Court of Human Rights or the United Nations’ Committee on Human Rights. To promote adherence to the rule of law, especially as it applies to refugees and forced migrants in Ingushetia and Chechnya. To monitor abuses against refugees in Ingushetia and Chechnya, provide legal assistance to victims of abuse, and publicize its findings. To perform activities related to the Rus­sian legal system and the development of legislation through nongovernmental efforts. The Council will continue to moni­tor legislative developments in the State Duma and regional legislatures, provide legal assistance to human rights organiza­tions and media personnel, and publish commentary on significant pieces of draft legislation and their relation to constitu­tional and international norms. The Council will also hold regular roundtables and seminars, help students with human rights work, and publish legal education material. To improve communication between deputies of regional administrations, their peers, and constituents. Panorama will work with five to ten deputies from regional councils to gather their opinions on pending financial reform measures, communal housing law, possible improve­ments to public service delivery, and improving public access to information on legislative initiatives. In addition, Panorama will continue to work with youth, training them in the fundamentals of journalism. To draw greater attention to the issue of freedom of assembly in Russia and to the “Strategy 31” movement, which seeks to protect this fundamental right. The organization will train a network of regional activists and coordinate their activities through mini-seminars and field visits, and conduct an information cam­paign through press conferences, posters, and educational handouts pertaining to freedom of assembly, to be distributed to the general public by regional partners. To reduce the prevalence of torture and other forms of abuse in prison through support of a prison monitoring system in seven pilot regions of the Russian Federa­tion; to present recommendations based on this effort to the federal government; and to promote international standards of prison management and monitoring. To publish its journal, The Caucasian Inde­pendent Cultural and Historical Magazine DOSH. Four Russian-language issues of DOSH and two English-language digests will be published with reporting from correspondents throughout the North Caucasus covering regional issues, includ­ing the consequences of war, human rights abuses, the role of women, and federal policies affecting the North Caucasus. The organization will also conduct three train­ing courses to improve the professional qualifications and skills of its editorial staff. To draw greater attention to human rights abuses through legal aid and outreach programs. This program will seek to improve the treatment of prisoners who are incarcerated in Russia’s system of prisons and penal colonies. The organiza­tion will investigate violations of prisoners’ rights, bring legal measures and public pressure to decrease the occurrence of such violations, and hold public tribunals to review particularly egregious cases. To continue building a network of re­gional partners that gather and dissemi­nate information about human rights. CPI collects updates from NGOs, the media and the Russian Human Rights Ombuds­man’s office on human rights violations, activities of activists, and events orga­nized by other NGOs. CPI then prepares press releases for Russian and foreign media outlets, NGOs and government agencies. CPI also disseminates infor­mation bulletins of other Russian orga­nizations to its distribution network. To monitor the press and extremist groups for instances of xenophobia, racism and intolerance. SOVA will publish reports and lead educational and mentoring activities to encourage democratic and antifascist activ­ists, and the general population, to oppose xenophobia in Russia. SOVA will coordinate and advance the efforts of experts, journal­ists, activists and law enforcement officials to secure effective enforcement of existing laws and to prevent the restriction of civil liberties in the name of anti-extremism. To help citizens engage the local bu­reaucracy to increase transparency and accountability. Eko-Logika will organize training seminars to teach participants how to request information from lo­cal government sources and will con­tinue to operate its resource center, which provides the necessary office equipment and consultative support needed to submit such requests. To encourage transparency and ac­countability in the municipal budgeting processes. The project will involve four components: an education component to train local activists and administra­tors on cooperative budget oversight; an evaluation component consisting of a survey of the public’s perception of corruption in the regional administra­tion; an analytical component, in which local activists will hold public hearings to discuss the city’s budget; and an informa­tion component to present the results of the project to the media and public. $49,980To expand and develop a web site that publishes the book An International Tribu­nal for Chechnya. The two volume study documents human rights abuses during the two Chechen Wars and argues that several incidents constitute war crimes within the meaning of the Geneva Convention. To support the activities of small NGOs in six regions in northwest Russia: Arkhan­gelsk, Vyborg, Kaliningrad, Pskov, Tver and St. Petersburg. The organization will conduct a series of online seminars, in-person training sessions, and discussion clubs to educate and train representatives of unregistered NGOs and civic initiative groups in organizational capacity building skills. The organization will also provide free legal consultations to civic activists. To increase access to information about Russian human rights and environmen­tal issues, and to encourage networking among NGOs. Bellona will maintain its web­site, www.bellona.ru a valuable source of independent information for the NGO com­munity, the media and the general public. To conduct its Human Rights School, and other workshops, for thousands of draft-age youth and conscripts. The organization will also continue to maintain a database on draftees and servicemen in order to track cases of human rights abuse at military bases across Russia, and will continue to develop and improve its interactive website to provide legal information and advice to draftees, servicemen, and their families. To increase youth advocacy programs in Sverdlovsk oblast, specifically those dealing with youth labor rights. Parity will conduct a sociological survey to deter­mine the nature of labor rights violations in Sverdlovsk oblast. Using the survey information, Parity will develop a variety of informational materials on labor rights issues, which will be distributed through its partners, public events, and website. Finally, Parity will implement a consultation program, which will include both one-on-one and electronic consultation sessions. To support its independent news and opinion website “Vibor33.” Two full-time correspondents will cover current events in Vladimir oblast and update the web­site daily. Lebed will also host four public forums for site users to discuss pressing regional issues and will work with partners to develop a more sophisticated interac­tive website interface. Lebed will work with local academics, politicians, entre­preneurs, and social activists to increase the number of blogs hosted on its site. To increase participation of young people in social and political life in Yaroslavl oblast. The organization will select four secondary schools in which to hold informational seminars on topics in­cluding student government, leadership training, communications strategies, and volunteer initiatives. The organiza­tion will also develop student councils in these schools, publish two informa­tional brochures, conduct study trips to the Yaroslavl Oblast Duma, sponsor four youth-oriented community projects, and operate a youth-leadership camp.